TeacherDance: A Final Post With Colorado Ties! Thank you Ruth and Stacey, at Two WritingTeachers, for this wonderful month! I know that the following is a love song, and I also know you may chuckle because it’s a John Denver song, and I’m from Colorado and we love all things John Denver. 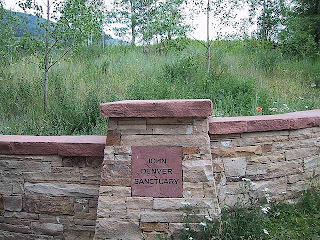 There is a park in Aspen dedicated to him. It has large stones in a kind of amphitheater with the words from some of the well-known ones carved into them. One autumn my students and I were going to travel to that area to study different areas of energy conservation, and we practiced the songs before we went. We visited the park and held an impromptu concert for any visitors there, and visitors were there! It was a lovely place, by large boulders in a stream, shady and cool, just as John Denver would have loved. One of the songs that especially touched us was Annie’s Song, a favorite of many in my class and me. I have thought all today and the recent days of what I would write in reflection of this month. It has been a month of challenges, both with the daily writing and my daily life. Yet I am proud that I persisted, staying up late to be sure I got the piece written, and trying to make each piece “count” for something. I also think I increased my reading speed because I wanted to read as many slices as possible, and give supportive comments. I couldn’t make it to everyone, even those I regularly read, some days. But I thought of you all as I got to know you, and was always grateful for your creative spirits, sometimes in hard times. Can you imagine how many thousands of words were written this month?! And how many students learned that they could write, and write some more, all because their teachers taught them all about slicing! It’s just terrific! Thank you all for your inspiration. And so, I offer the first verse of Annie’s song, full of good feelings for all of you. The middle verse is more loving of one person to another, and if you want to read the entire song, you can find it here. It is also on ITunes. Best wishes for a very happy spring. Hope to see many of you on Tuesdays! What a touching way to wrap up the end of our month! I am planning to visit your blog over spring break and read up on posts that I missed! See you on Tuesdays! Thanks Amy. Have a great break! Your comments are always so encouraging. I think that you encourage others because you have gone through so much. Thank you for being there. Thank you Ruth. Looking forward to Tuesdays! "Can you imagine how many thousands of words were written this month?!" I know -- pretty amazing, and hopefully, educators who were taking part will see the power of that writing and help them think about their students as writers, too. I hope so, too, Kevin. It's something I try to encourage at school often. You are welcome! Many thousands of words written and read. Amazing. There's a reason that Stacy and Ruth called the monthly writing a challenge not a festival. It's a challenge to write, and read, and comment daily. At the same time it is a party bountiful with emotion, ideas and inspiration. Thank you for your slices and comments. You are welcome, Terje. It was an amazing month, wasn't it? Barry Manilow (Amy Rudd) then John Denver. There is something in the air today. You have been an integral part of this community with all your supportive comments and posts that inspire. Thanks! See you Tuesday and Friday, for sure...maybe more. So happy that we've connected, Margaret and that you joined in both communities. Thank you! It is inspiring to think of all the words thought, written, shared, read and responded to. I always feel like your words are meaningful and important. Thank you for being such a support to so many in the community. You're welcome, Betsy. It is a pleasure! Perfect song for today, Linda! What fun it has been, again. Between slicing, the Monday book share and the Friday Poetry share, I feel so connected to you. Perhaps we'll meet at NCTE this Fall - which will be a rather grand event to slice about, don't you think?! I am really hoping to get to Boston, Tara. Yes, it would be a delight! Happy Easter, and thanks! Beautiful Linda! I love that song as well . . . "filling up our senses" . . . how right you are this community certainly does this! Thanks for sharing. Thanks Lynn. Isn't it interesting how lyrics just come to us, as this one did for today? I'm happy you think it's fitting too! Linda- Your posts always amaze and inspire me. You participate wholeheartedly in so many different things- Slice of Life, It's Monday…, CYBILS, Poetry Friday. You comment way more than anyone I know, and not just on a surface level. And then you respond to other people's comments too. And thanks for a reminder of this song. 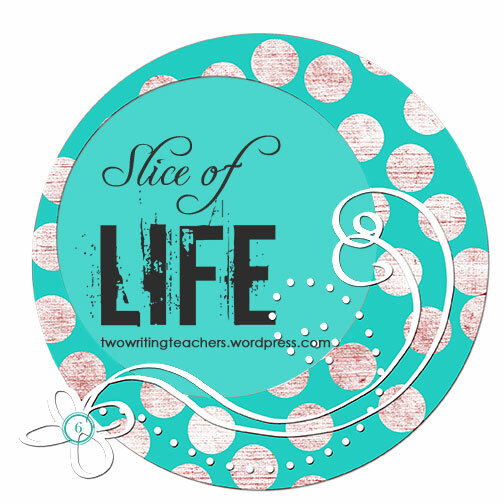 I agree with you- it's a perfect way to end a month of Slicing! It's in our Colorado souls, isn't it, Carol? Thank you for you comments, always! We must get together in the spring! Linda, you have a talent for finding that just right word, phrase, sentence, post. I marvel at all you accomplish. You have a grace and beauty about you. I'm glad you are here every day. Have a blessed Easter! Thank you Elsie! I hope your day is a special one, too! I couldn't have said this better, Elsie. Grace and beauty are words that always come to mind when I think of you, Linda. Have to say that this bit of Denver's lyrics/poetry speaks to me too. Thank you. I'm glad you're here every day too. Just arrived home from a lovely day with my daughter & family, and seeing my husband. It's 70 degrees plus-a very good day indeed. Thank you Mardie-it's been great getting back in touch this month! Just beautiful! I love John Denver and think that this song is the perfect way to end our month. Thanks for all of the inspiration, Linda! You're welcome, Katherine. Always great to hear your teaching inspiration too! The mountains are very special for sure, Jackie. Thanks for the nice comment. So happy to hear a little John Denver love! Thanks for all your writing and your commenting. We appreciate you! Thanks Maria. Perhaps we can still get together about the gifted ones before school is out! Between you and Amy Rudd, the two of you are getting songs from some of my favorite artists stuck in my head today. Someday I hope to see that park you mentioned. I just adore Denver's music. It is a really special place, Stacey, and a favorite memory of being with my students. Thank you! I never would have thought of it, but that song does describe perfectly what it's like to read so many wonderful slices. Great thinking, Linda! (I love John Denver too!) As always, I have enjoyed the extremely thoughtful comments you've left me all month. While I'm sad that we won't be sharing words every day, I'm looking forward to "seeing" you and others on Tuesdays again. Thank you! You are welcome, Jennifer. I'm looking forward to Tuesdays too! Happy Easter! Linda,thank you for your encouraging words, for me and so many oaths. It HS been exciting to see how many people have written and will continue to write, I will continue to see you on Tuesdays. I already have books pre-posted, so I am excited to be back into the book sharing as well. I'm happy to hear you'll be back with the groups Mary Helen. You always have so much to offer about teaching and writing! Thank you! You provided so much encouragement to so many this month, Linda! Thank you for all of the feedback and comments. I always looked forward to your posts and the gradual revealing of some of your personal challenges. Thanks for the John Denver memories, as well. We used to sing Annie on a regular basis at our house. Happy Easter, Linda. You continue to inspire me and keep me reading and writing. Thank you Melanie, for all that you've posted too. I still need to return & catch up with all your teaching posts-they've certainly given me some new ideas! Thank you, I need to get to reading now. I've been prepping for going back after spring break-time to get going! It's been a great month, hasn't it? It was a wonderful March, wasn't it. I didn't read nearly as many slices as I usually do, but tried to get to some every day. Some new, some old friends. As much as I love March, I am looking forward to the ease of Tuesday slicing :) Here's to many more! Thanks Deb. it's always good to hear from you, but really I look forward to your posting as much. Have a terrific spring! 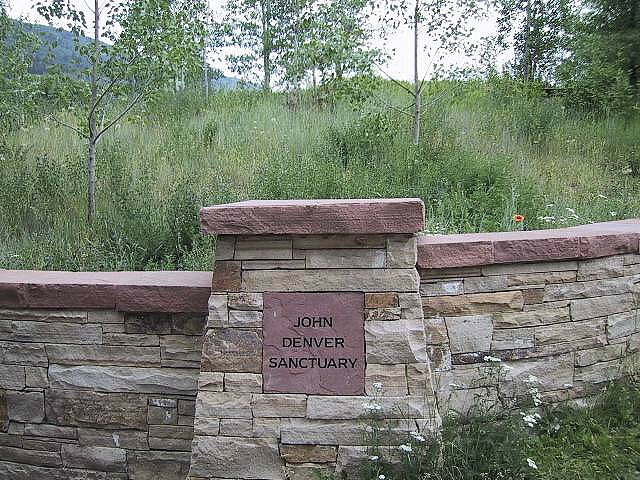 One of my favorite John Denver songs! Yep! Two years & still going, Donna. I'm looking forward to your A to Z poems! This is one of my favorite John Denver songs. I've enjoyed reading your slices and appreciated your supportive comments. Thanks for sharing! You're welcome Catherine. I hope to see you on Tuesdays! Thanks for sharing this song - one that I have always loved. However,I haven't listened to John Denver in quite a while. I enjoy your posts and am grateful for the comments you have left on mine. See you on Tuesdays! Thanks Judy, it's been good getting to know you better, & I love that you are in my old home state of MO. Glad you like the song. What a lovely way to end the SOL March! I have always loved John Denver. Great choice to share. I have so enjoyed visiting your blog and reading your slices. I do so admire you. Will definitely keep stopping by. Thanks Beverley. I've really enjoyed your post, too. Looking forward to more! I hope you had a Happy Easter! I was clicking on blogs on Mary Lee's site and decided to visit you. This Slice of Life sounds so interesting. I have been reading about it here and there. YOU are so busy. Annie's Song was my father's favorite.....he called it Jaynie's Song for my mother. He was a master trumpeter and it was so beautiful when he played it. A real love song. A bit of it was played as part of the eulogy. It was nice to think of this today. Maybe I will try Slice of Life next year.....a built in writer's group at the touch of your keyboard. Cheers, Janet F.
Wonderful memory, Janet, of your father. I hope you will try the slice of life next year! Thanks for coming by! I LOVE Annie's Song too. Who doesn't :)? And like you, I tired hard to keep reading lots of slices even though it was hard to keep coming back to the endless list. It used to be as easy as listening to a sweet John Denver song. Thanks, Bonnie. Yes, there were so many posts I just had to choose. But I know I missed a lot of good thoughts!